Defense Secretary James Mattis speaks about the National Defense Review, Friday, in Washington. 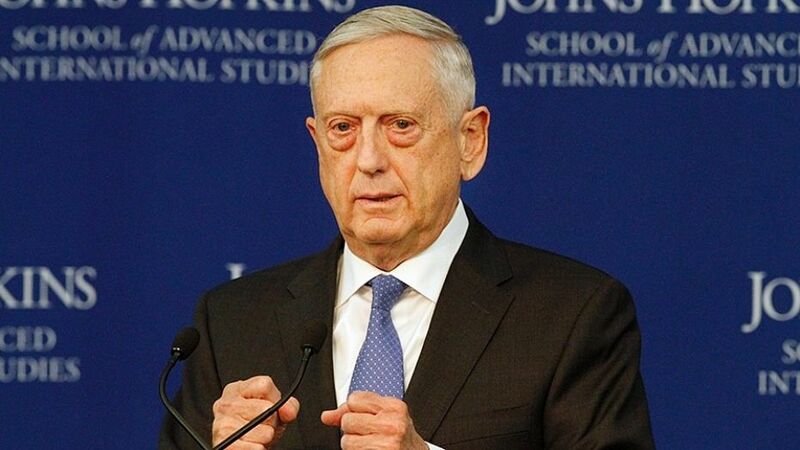 The U.S. military’s advantage over Russia and China is “eroding,” according to an unclassified summary of the Pentagon’s new National Defense Strategy unveiled Friday by Defense Secretary Jim Mattis in Washington. The document also says that ISIS no longer remains a top threat. Mattis named the rogue regimes in North Korea and Iran as top threats as well. But the strategy does not ignore the ability of terrorist groups to persist and evolve. ISIS has largely been defeated in Iraq and Syria, but Mattis warned the group will keep trying to reestablish itself and make a comeback like Hezbollah and Al Qaeda. He warned that America’s ability to respond to threats has diminished. Mattis said the modernization of China’s military over the past two decades as well as Russia’s advantages coupled with the U.S fighting its longest war in the nation’s history have led to loss of a competitive advantage. Mattis went on to say the goal of this strategy is to send a message to anyone that wants to take on the U.S.
“To those who would threaten America’s experiment in democracy: if you challenge us, it will be your longest and worst day,” he warned. This is the first national defense strategy in 10 years. The classified version of the strategy is five times bigger than the 11-page unclassified report released today.